You can use our professional carpet cleaning services which we offer in and near Hammersmith to homeowners and holders of business estates to improve the condition of your carpets. They need more than vacuum cleaning and stain removing which should be implemented by certified technicians. Our employees are experts in deep cleaning of carpets made of natural, synthetic and a combination of both materials. They use tried-and-tested and effective detergents, sprays, machines and tools designated for carpets. Contact us over the phone or online to ensure the presentable and more hygienic condition of your carpets and rooms. If you need one-off implemented reliable and thorough sanitising of your carpets you can call us or use our online booking form. The work of our staff includes initial inspection of each carpet and choosing the most appropriate detergents and sprays. They apply them after moving all items from the carpets and let them work. Then, our cleaners carry out hoovering and hot or cold water extraction. These machines use cold or hot cleaning solution which is injected in the fabric and removed along with the dirt and moisture after that. The final stage of the cleaning is spraying the whole carpet. Our carpet cleaning services can be used by homeowners and holders of estates residing in W6 and nearby. You can restore the condition of the carpets in your house, flat, office, rented property, hotel and other estate by using our services at least a few times in the year. The machines and preparations with which our staff work are effective and advanced. 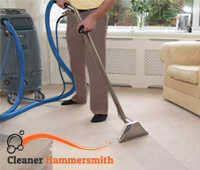 The carpet cleaning, provided by our company headquartered in W6, Hammersmith is profession and affordable.